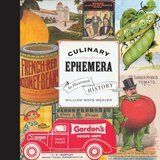 UC Press is proud to announce that Culinary Ephemera: An Illustrated History by William Woys Weaver was named Best Culinary History Book by the International Association of Culinary Professionals (IACP). This extraordinary collection, a trove of enchanting designs, appealing colors, and forgotten motifs that stir the imagination, features an unprecedented assortment of ephemera, or paper collectibles, related to food. William Woys Weaver is Director of the Keystone Center for the Study of Regional Foods and Food Tourism. This year marks the 25th Anniversary of the International Association of Culinary Professionals Cookbook Awards – the gold standard for culinary publishing. More than 500 titles were entered into the 2011 awards rigorous two-tiered judging system by independent panels of food and beverage experts in 17 categories. The IACP is a worldwide forum for the development and exchange of information, knowledge, and inspiration within the professional food and beverage community. With nearly 3,000 members from more than 32 countries, this organization of creative and talented professionals is engaged in and committed to excellence in the food industry.